I just discovered Structure and Interpretation of Computer Programs, by Abelson, Sussman, and Sussman aka SICP aka The Wizard Book. 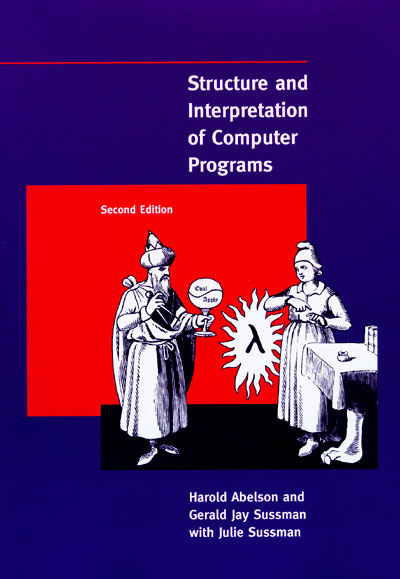 It’s a computer science text book that introduces computer programing. It uses Scheme, a dialect of LISP, as the example and basis with which to teach. I’ve been on the hunt for a computer science book I can click with. I’ve read/skimmed a lot of them. I mean A LOT. Both in print form and on-line. For some reason my mind has a real hard time staying focused while reading about functions, lists, arrays, operators, etc. But this book feels different. Maybe it’s the magic analogy at the beginning of the first chapter that inspires me. A computational process is indeed much like a sorcerer’s idea of a spirit. It cannot be seen or touched. It is not composed of matter at all. However, it is very real. It can perform intellectual work. It can answer questions. It can affect the world by disbursing money at a bank or by controlling a robot arm in a factory. The programs we use to conjure processes are like a sorcerer’s spells. They are carefully composed from symbolic expressions in arcane and esoteric programming languages that prescribe the tasks we want our processes to perform. What ever the reason I am some how starting to feel as if I get it. Get computer programing that is. I bet that the decade plus of reading a little bit here and a little bit there is adding up. But I have to thank MIT and this awesome free book for helping out. Getting a real foundation of knowledge is making a difference! Now to leap over the wall my brain has built and release some code I’m proud of. Justin has an amazing post called Search Engine Marketeers are the new script kiddies. I recommend that ALL WordPress bloggers read it. Especially if you use Dreamhost. (even you non geeks) Basically someone hacked a WordPress theme file on justinsomnia.org and inserted key words to influence Google Ad words. This caused justinsomnia.org to be removed from Google’s index. Thus making it impossible to search Google and find justinsomnia.org. Cool thing is Justin investigated, found out what happened, and discovered who did it! …the last two days felt uncannily like the Borne Ultimatum. Without the punching. Yep. A pretty dang good deal. Dell laptop with Ubuntu for sale. I think this is a wonderful deal for non-profits. There is little reason left now for NGOs to be shackled to Microsoft products.